(CBS/WTVR) - DOSWELL, Va. - The grandmother of a Va. autistic boy who went missing for 6 days says the child shouldn't have been at the park where he disappeared. Robert Wood Jr. disappeared on Sunday, Oct. 23 while on a hike with his father, younger brother and his father's girlfriend. The 8-year-old, who was the focus of an intense search involving thousands of volunteers, was found Friday at a quarry about a mile from North Anna Battlefield Park where he went missing. Wood's grandmother, Norma Jean Williams says that the 8-year-old has a tendency to run away. This is something she says his father knows, reports CBS affiliate WTVR. She questioned why his father would have taken Wood to such a heavily-wooded, vast park. "This is the first time he's gotten him in months and months, there was a lot of anger that first day," Williams said. Tensions reportedly ran high as the child's family searched the woods along with thousands of other search volunteers. "Thursday night I lost all hope, I was saying things to God that weren't very nice," added Wiliams, WTVR reports. Williams described receiving the news that Robert had been found alive. "All I could say was 'thank God,' because I don't think Robert would have lasted one more day...I don't." She reportedly said he survived because he's not afraid of anything and that his brave spirit kept him going. 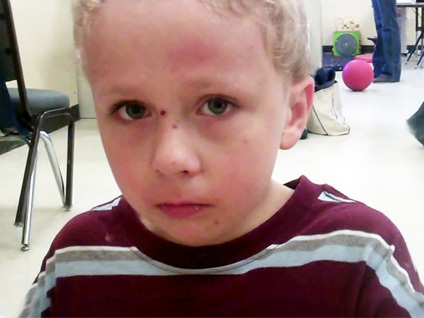 "There's no fear I think that is what helped him, he's a tough little boy," Williams said. The family said Wood could be released sometime this week, WTVR reports. He has a lot of bug bites and scratches, Williams said. She also added that he is completely exhausted. He has undergone a variety of tests to check his health. October 27, 2011 - Search continues for missing autistic boy Robert Wood Jr. in Va.
October 25, 2011 - Police seeking the public's help in search of 9-yr-old missing autistic boy in Va.